Robert Allen of Oxford University has done some of the best work on the Industrial Revolution but he has also helped us understand the historic energy transition from Wood to Coal, in England. Along with the work of Vaclav Smil, Allen has shown that energy transitions are long, drawn out affairs that do not comport with the faith in efficiency that defines contemporary economic theory. 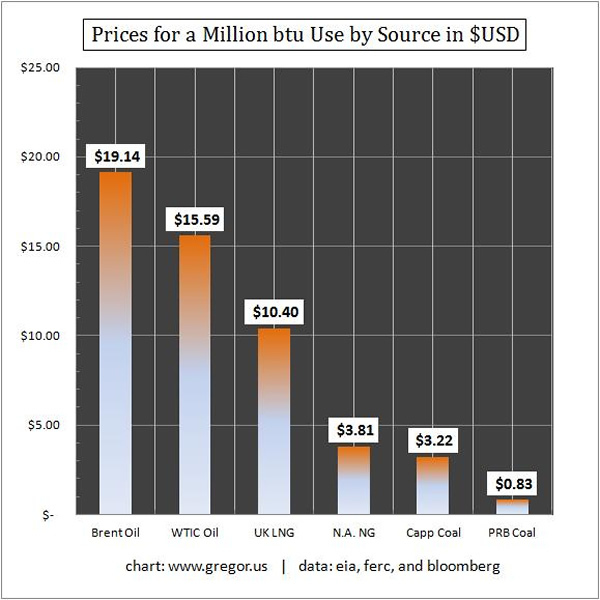 This chart of BTU prices shows that natural gas is being offered each day in the bargain bin to the economy, but the economy is so inextricably tied to oil (liquids) that its existing infrastructure cannot take advantage of the opportunity. Have you heard any economist, from Joseph Stiglitz to Nouriel Roubini, from Greg Mankiw to Robert Barro, or from Robert Reich to Larry Summers, even mention that a million BTU in natural gas can be obtained at a nearly 75% discount to a million BTU in oil? This is precisely the kind of market failure that contemporary economists exhort their students to discount. Faith in price, and the power of price, is thought to be paramount. As we know, energy costs are part of the basic business proposition for an economy. It is completely understandable that when oil priced at $14 a barrel for nearly 25 years after WW2 (in inflation adjusted terms) a new highway system, built with cheap oil and utilized with cheap oil, returned enormous profit to the economy. California’s embrace of that proposition was a trade in which low margin agriculture was swapped for much higher margin wages in Defense and Aerospace industries. This is what characterized the post-war economy in places like southern California: if you have a very powerful and energy-dense input at your disposal, you will use it ad infinitum to maximize your profit. California’s gargantuan accumulation of wealth, and its rapid build out from 1945-2000, was funded by oil. Now what?